Priyanka grabbed dinner with close friends in Mumbai on Thursday evening wearing a printed top and matching pants both from Sanchita. Wish we had better pics. While at a recent movie screening, Richa paired her mesh Sanchita dress with a slinky velvet number under. Updo in place, the actor finished out her look with a quilted bag and pair of black booties. Recently, Ileana went the sporty route when promoting her latest movie. Adding a Sanchita jacket to her Kanika Goyal cropped tee and Hemant & Nandita culottes, the actor finished out the look with a ring from Isharya and classic black pumps. Though it may take a second or two to warm up to the look, you’ve got to concede it’s one she made work for her. 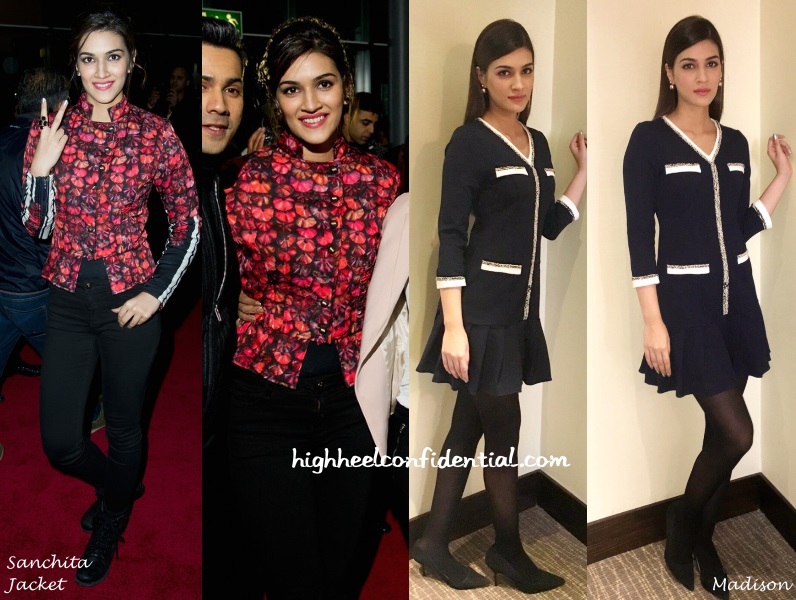 In London for Dilwale promotions, Kriti was seen in two different looks, first in a black Madison dress and then in a printed Sanchita jacket and high-waisted denims. As much as I want to like both looks, I don’t quite. The dress felt too airhostess uniform-like and the jacket just didn’t work with the lace-up boots and denims.